You’d better believe I attended the official grand opening and ribbon cutting this past December 16 for the newly renovated Eagle Court Apartments on Morton Avenue at Eagle Street. No way I would miss the ceremony marking the completion of this important renovation project in my neighborhood, turning perhaps the most notorious slumhole in the City of Albany into a beautiful place to live. All 47 apartments in the building have been spoken for ahead of the opening, tenants began moving in the next day. I’m told that in addition there is “a waiting list a mile long” for the apartments. Imagine that... people are lining up and fighting for an opportunity to live on the lower part of Morton Avenue. The old exterior of the building is essentially unchanged, but everything inside, including the walls, is brand new and shiny. 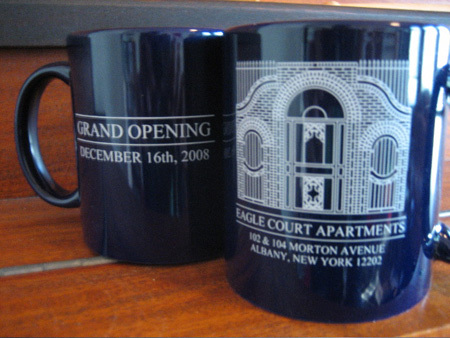 If I were looking for an apartment, and had a chance to move into Eagle Court, I wouldn’t hesitate. And if I owned the place, I’d be proud to rent out these spaces. I made sure to stroll down the hill from my house and arrive a half hour early around 10:30 AM. I could see immediately by all the activity that the ceremony would take place on the uphill Eagle Street side of the building, not to mention the balloons tied to the porch rail. The guys who do the actual building work were very busy planting street trees and laying topsoil between the sidewalks and the curbs. I watched the media workers arrive and set up on the other side of Eagle Street. They usually turn out in force for these ribbon cuttings, and they stick around unless a plane crashes into a suburban house, in which case they all disappear like magic. That didn’t happen this time. But despite the media presence, I only saw marginal coverage of this event in the two daily papers, and absolutely nothing about the story behind this building. Albany Housing Authority (AHA) and other City employees arrived and went inside, visibly happy for this opportunity to get out of their offices for a while. Employees also showed up from Omni, the contractor who did the renovation. The Omni guys in suits looked much less thrilled to be present, but I noted that some of the Omni workers marched inside to help themselves to coffee and muffins. I briefly considered forcibly crashing this semi private affair, but decided to behave myself. Various nonprofit agency heads and employees arrived, most of them stood outside in the cold like me. A handful of neighborhood folks also showed up, and we had a decent sized crowd. Finally, Mayor Jennings arrived in his chauffeur-driven black SUV, which dropped Him off and then backed discretely out of sight. Almost immediately His Majesty set to waving the media workers closer to the action on the porch, so that they stood in front of the crowd. The suits emerged from inside, this was the signal to begin. The porch was kinda small, so it was hard to put too many dignitaries up there. 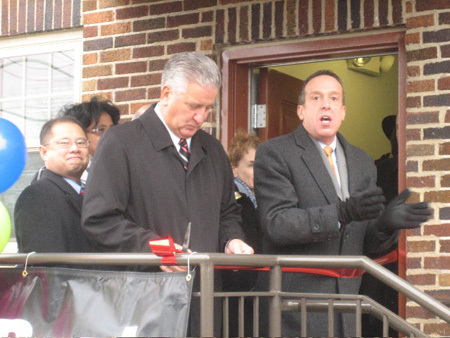 Fortunately the speeches were brief and The Mayor has a lot of practice cutting ribbons. In no time all of us were invited inside to inspect the new apartments and check out the tray of muffins. I heard words and phrases such as “this is incredible” and “I can’t believe this” and “I never thought anything like this would ever happen.” More than once I heard the word “miracle.” Here was solid proof, evidence exhibit A, that Albany does not have to accept and live with neighborhood blight. More than anyone else, the person responsible for this incredible transformation is Steve Longo, director of AHA. I’ve said it before and I’ll say it again, the City of Albany is lucky to have this guy. He is leading the rebuilding of the housing landscape in the City, and somehow at the same time managing to avoid washing up cold and stiff against the political rocks. 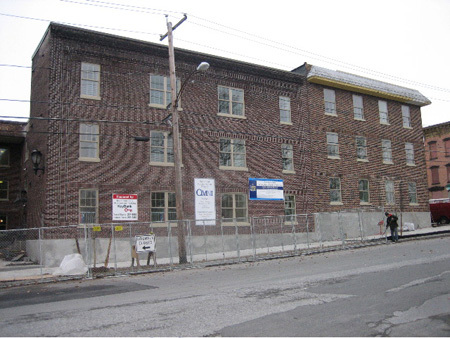 About nine or ten years ago, Mr. Longo and his staff put together a plan for transforming the South End as part of the application for a big federal grant program called Hope 6. Putting the plan together cost hundreds of thousands of dollars and many months of staff time. 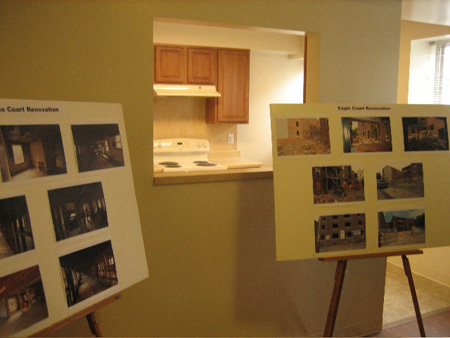 The City had already received one massive Hope 6 grant to rebuild the horrid Corning Homes in North Albany, so it was not unreasonable that the City would receive another grant for the South End. But politics got in the way and the grant application failed. The NY State Republican Party (read: Joe Bruno) found a way to stop then secretary of Housing and Urban Development (HUD) Andrew Cuomo from giving the Hope 6 money directly to the City. Technically, the money is supposed to be given to the State, but with Republicans in charge of the State at the time there was no way the money would ever get to the intended recipients. After the pointless Republican disruption (aren’t they all pointless?) the application, of course, was rejected. However, as I’ve heard Mr. Longo explain on more than one occasion, there was no reason to let a good plan go to waste. So, with The Mayor’s approval, Mr. Longo and his staff searched for alternate funding sources so that the plan could be implemented piecemeal. The other half of phase one is taking place not far away, on a mostly empty lot bounded by Broad Street, Clinton Street, Third Avenue and Fourth Avenue. This new development is an appropriately urban mixture of rental and owner occupied housing called Jared-Holt, after the long gone wax factory that was on the site. The expected opening for this project is late January, stay tuned. Going back forty years, Eagle Court was a decently run desirable place to live. But in the 1980s, a person named Roger Ploof bought the building, after which Eagle Court became a crack and heroin supermarket, home to a mixture of criminals living side by side with some of the most helpless members of society. As the years passed, the Ploof Building had a devastating effect on the surrounding neighborhood, as can be readily observed today. The building was heavily infested with vermin. A woman who briefly lived there told me that when she used the toilet at night she had to remember to flip on the light and wait a moment, otherwise she would crush a half dozen cockroaches when she sat down. 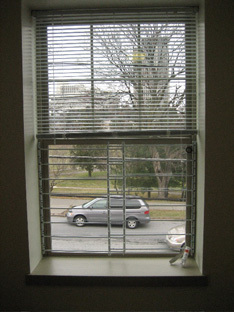 I heard ca report from one of the few, long-term respectable residents of the building (perhaps the only one?) that it was not uncommon to hear gunshots in the hallways, including an incident in the very last week the building was open before renovation. How did Eagle Court turn into a hellhole, and stay that way for three decades? Ploof owned rental properties across downtown, notably in Park South, North Allen Street and Central Avenue. As far as I’ve heard, all of his buildings were very much like Eagle Court. As a landlord myself, I am loathe to defend Roger Ploof. Yet it is evident that the City government, going back to evil Erastus Corning, had written off downtown Albany, particularly the South End. Without question our last three City administrations were looking forward to bulldozing the entire South End (“urban removal”) and eventually selling off the vacant land to line their pockets. Basically, Ploof followed the business model that the City wanted him to follow. Successive City administrations wanted decay so that they could bulldoze our part of the community out of existence. What better way to accomplish that end than to encourage property owners to extract wealth from our neighborhoods by creating slums. But our City leaders forgot about the people who live here in the South End. Many born and raised natives and immigrants like myself refused to give up on our community. As time passed we learned to push back and fight when the City tried to destroy our homes. There have been thousands of little battles fought between the citizens and the City government all across the South End. But there were two major battles in particular that brought people out en masse and angry. These two public fights forced the City administration (read: Jerry Jennings) to radically change its attitude toward the South End. 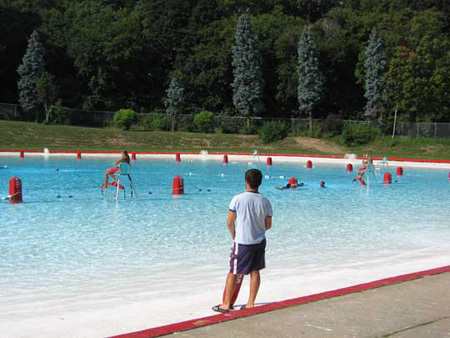 The first was in 2002 when Jennings tried to shut down our unique Lincoln Park Pool and give the parkland to a private developer. More than 250 neighbors came out during torrential rainstorms to unanimously tell The Mayor to leave our pool alone. By the end of this public confrontation, I could see by The Mayor’s face that he knew that he could not dictate this scheme to us. We kept our pool. The next battle was in 2003 when The Mayor told a sleaze bag developer that he could locate an asphalt plant down by the river. I mean, c’mon. This operation would have spewed sulfur dioxide by the ton into one of the most densely populated parts of the Hudson Valley. What kind of “civic leaders” would do something like that? The kind that want us to get sick and die, that’s what kind. After these two uprisings Jerry Jennings developed a new attitude. He could see that there would no political gain from waging war on the citizens of the South End. Indeed, if people are that angry, then such a war could very well lead to His ignominious downfall, politically and otherwise. After that, Jerry Jennings did the best possible thing that He could. After taking ceremonial credit for launching a “South End revitalization effort,” He stepped back and let AHA and the City planning department implement the plan without much interference. For a long time I’ve wanted to thank The Mayor for doing this. Outside before the ribbon cutting at Eagle Court, The Mayor walked a wide arc around me while he was working the crowd. Regular readers of this blog will not be surprised to hear that He didn’t want to look at me. I thought I’d chosen my words carefully, to be as accurate and as complimentary as possible. But afterwards, several people to whom I told this story guffawed, “Haw, haw, let it happen, huh? That’s tellin’ Him!” Which is not what I had in mind. Diplomacy and charm have never been my strong points. What happened next is that The Mayor decided to tell me a little story. Also present fror this extraordinary tale was Pastor David Traynham of the nearby New Horizons Christian Church on Catherine Street, our neighborhood church. Here’s the story as best I remember it. Well (said The Mayor of the capital of New York State,) I had one of those big history books on my desk. I put my hand on it, slid it fast across the desk and hard into his gut and he doubled over. I then grabbed the back of his head and slammed his face into the desk. That last is an exact quote. The Mayor then saw fit to add that his boss at the time admonished him lightly for this act, but conceded that “this was the best way to handle that kid.” Another exact quote. I wonder how many people have been terrified and intimidated by this story? The good pastor, who was one of The Mayor’s students a long time ago, looked rather uncomfortable. As for me, I’ve been threatened so many ways by so many people over the past five decades that I barely notice anymore. Next time, bring a gun. 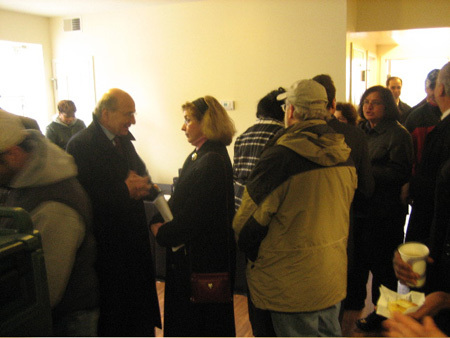 After these pleasantries I explored the apartments and had several very good conversations, not to mention chatting with half the people in attendance. And I grabbed a couple of souvenir mugs, one for me and one for The Wife. As for Roger Ploof, the City bought Eagle Court from him for a ridiculously large sum of money, which was worth every penny. Again, The Mayor is to be commended for negotiating this difficult sale. It took several years, but Ploof eventually figured out that the landscape had changed and it was in his best interest to give up his cash cow slum building. Earlier this year, I learned to my horror that Ploof had taken the pile of money he’d made from the sale of Eagle Court and was buying buildings on the other end of my neighborhood, along the streets behind the eastern end of Delaware Avenue. I mean, what for? I recall years ago seeing a picture of Ploof in the Hearst Times Union with his Lamborghini, complaining that his fancy Italian sports car was a lemon. His “summer home” is a multimillion dollar Victorian mansion in the upper class onclave of Cape May, New Jersey. Doesn’t he have enough money? Yet it appears that Roger Ploof, like Jerry Jennings, is also a changed man. I’ve been told by Sandy LeVan, ace tenant/landlord/court negotiator for the excellent tenant advocacy group United Tenants of Albany (UTA,) that complaints about Ploof’s buildings have dropped off to nothing. Ploof used to be a major contributor to the UTA workload, but not anymore. Suddenly, as if by magic, Ploof has apparently become a responsible rental property owner. 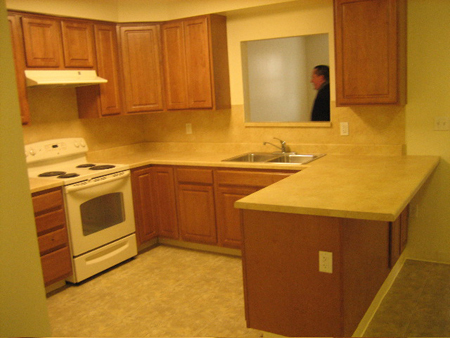 This is a simple example of how landlords are not the root cause of slums and blight in the City of Albany. Guys like Ploof only play by the rules they are given. Change the rules, and the players will play a different game. The government of the City of Albany turned Eagle Court into a hellhole, so it is right and proper that the City government take responsibility. I can report that in this case the City has done an excellent job of repairing the damage done by their destructive policies. The only question remains, is this initiative enough to please the voters of the South End? Or is the Capital South Revitalization Plan too little too late for Jennings reputation? No doubt we will all find out after this New Year, certainly by election day in September. Holy Erastus Corning, Jennings looks like a Mafia Don. Seriously, how many Mayors in this country still sport the slicked back "Goodfellas" look. Someone call Scorcese, looks like he has his next Mafia hit coming straight out of Albany. As a resident of the Second Avenue Neighborhood, I have lately taken notice of the miracle at Eagle Court. And while I am happy when neighborhood blight is combated, I'm really happy when it's part of a longer-term, well-conceived strategy, which the Capitol South plan may very well be. But if I know the Jennings administration, it will amount to a lot of sloganeering and half a$#ed action. The problems that Albany is facing are due to decades of neglect, an underwhelming investment in the local populace, and a lack infrastructure to appropriately deal with the problems of failed federal urban policy. What we need RIGHT NOW is a better way to connect with a broader base of Albany's citizenry and tools to organize - I can't always attend face-to-face meetings - let's think about Facebook - something, anything! OK. I feel *slightly* better now. 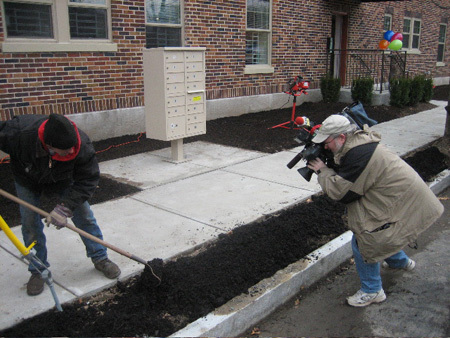 One 'good for the people' project in 15 years still doesn't outweigh his continued lack of action in Albany's other depressed neighborhoods, unless you consider the Park South project, also formerly owned Ploof rentals, as a good thing. Maybe it is, but not for the good people it displaced who couldn't afford to move into their rehabbed apartments. I agree with veryred. But honestly, this project is a case of too little too late. But it's nice you credit the mayor. I thought Steve Longo was the motivating force behind this project and that it's he who deserves the praise you're heaping on Hiz Onerous One. Any word on the $300 million garbage burning ethanol plant going up at the Port? The guy in the black coat. Is he standing in bathroom taking a leak? Sure looks like he is. I understand that these buildings are designed probably for poor people, but the pictures suggest that they are filled with crappy projects-style material. The interiors of the building look like they are designed to be gutted within 30 years, complete with wallpaper appropriate for a doctor's office or a mental institution. I guess it's better then the alternative of another vacant building. But shouldn't the city being to try to bring in desirable, rather then reinforcing poverty-housing? NY Cowboy, You can always be counted on to make the most bizarre comments. Actually, these apartments look like the interior of a new suburban house on a curvilinear street, and are built with the exact same materials. An upscale suburban house would have more expensive cabinets and appliances, and maybe some decorations from Home Depot. 99+ percent of our construction is done by the disposable method, which means it is all designed to end up in the "landfill." But that's another conversation. But I can tell you, while I would have much preferred to rebuild the existing walls in place, this was not possible here. Eagle Court had gone through too much abuse by the previous owner. We are lucky to still have the exterior. Cowboy, where do you suggest the poor live, in tents? Some of the worst maintained homes I've been in have been owned wealthy citizens. Simply deplorable, holes in walls, stained carpets, etc. and some of the finest homes I've been in were owned or occupied by the poorer among us. Where exactly in your mind's society do the poor fit in? Pray tell...where would you have them live? Or have I missed your point entirely? Do you believe we should spend even more for housing our poor, that the millions spent on this one project was insufficient because it's not equipped up to your standards?